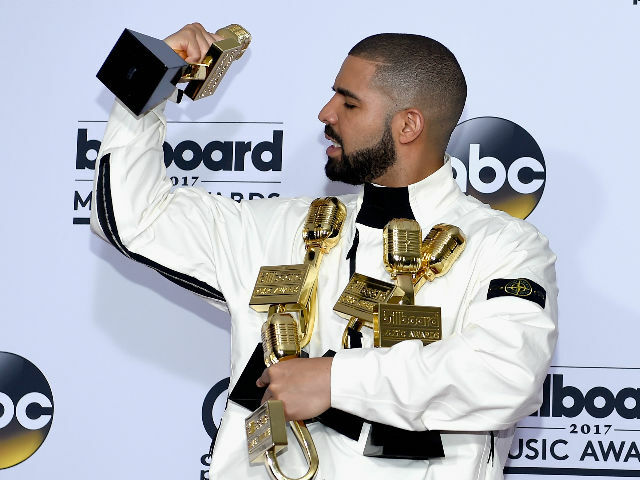 Rapper Drake grabbed a record 13 wins at the 2017 Billboard Music Awards on Sunday, eclipsing Adele's previous record of 12 awards in 2012. "I want to say, hold tight Adele, because when a new thing drops you'll be back to get the record back," the Canadian recording artist said in accepting one of his awards at the star-studded event held in Las Vegas. Drake, who also won top artist, top male artist and top rap album for Views, later posed for photographers surrounded by his microphone-shaped trophies. The three-hour show - hosted by hip-hop artist Ludacris and former High School Musical star Vanessa Hudgins - included performances by Miley Cyrus, the Chainsmokers, Nicki Minaj and Imagine Dragons. Beyonce and Twenty One Pilots each took five awards, although they were absent from the ceremony. The Chainsmokers earned four, including top collaboration and top hot 100 song for Closer with Halsey. Blake Shelton took home the award for top country artist, and top country song went to Florida Georgia Line. Justin Timberlake's Can't Stop the Feeling won top selling song and top radio song. The Icon Award for achievement in music went to Cher, 71, who gave a heartfelt speech after performing two of her biggest hits - Believe and If I Could Turn Back Time. "I want to thank my mom because when I was really young, my mom said 'You're not going to be the smartest. You're not going to be the prettiest. You're not going to be the most talented, but you're going to be special,'" Cher said. Canadian singer Celine Dion delivered an emotional performance of her award-winning song My Heart Will Go On from the soundtrack of the movie Titanic to mark 20 years since its release. Celine Dion, who was Billboard's Icon last year, lost her husband and former manager Rene Angelil to cancer in 2016. Top Selling Song: Justin Timberlake, Can't Stop The Feeling! Top Radio Song: Justin Timberlake, Can't Stop The Feeling! Top Country Song: Florida Georgia Line, H.O.L.Y.